If you don't have the luxury of being able to park your car in a garage at night then you have to deal with frozen car windows in the morning, who knows maybe it's so cold in some places right now your car gets frosty even if it's parked in the garage. We've probably all been there, driving and trying to see out of a tiny little opening in the frost. You can keep your car windshield and windows from getting frosty by using three parts water, one part vinegar, pour mixture into a spray bottle. 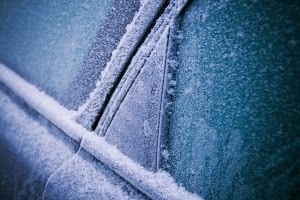 Spray your car windows with the solution at night when you park your car, it will help keep the frost from building up. You want to make sure the vinegar is diluted, straight vinegar can harm the rubber in the window seals and wiper blades. If you didn't have time to spray with vinegar at night and you go out in the morning and they are already frozen over, spray with rubbing alcohol, turn on the defrost and they should melt very quickly. You could try something like this...I've never used it before!